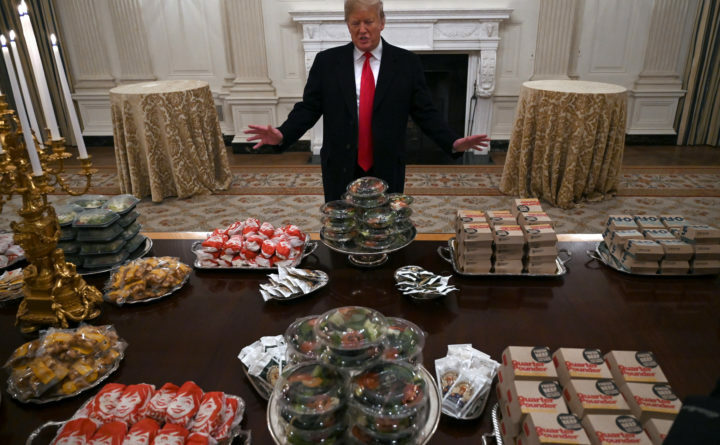 President Donald Trump talks to the media about the table full of fast food in the State Dining Room of the White House in Washington, Monday, Jan. 14, 2019, for the reception for the Clemson Tigers. There’s something sublime about the image, a quality that pushes it past absurdity, through camp and into the realm of true art. The president of the United States, arms out and hands open, grinning, directly under a portrait of his greatest predecessor, Abraham Lincoln. Candelabras on each side are lit to full brightness, welcoming us, the viewer, into a fast-food feast of epic proportions. Burgers as far as the camera lens can capture! Side salads piled high on a serving platter! Filet-O-Fish sandwiches for those who aren’t interested in Quarter Pounders! Every sauce the heart could desire for McNuggets that were just out of sight! A whole table of pizza elsewhere in the room! Wendy’s, McDonald’s, Burger King, Domino’s: Justice League and the Avengers have nothing on this. The cornucopia’s $3,000 (estimated) tab, assembled to honor the national-champion Clemson Tigers, was picked up by Trump himself. The shutdown and all that, you see. It is, on every level, a master political stroke. Trump comes off looking like a beneficent billionaire, providing succor for his guests on his own dime. He plays right to his populist strengths, assembling a mélange of foods that every American is familiar with and most Americans have eaten – and probably recently. I’d be lying if I said I wouldn’t be happy to gorge myself on the provided platters. And Trump has also set a perfect trap for his critics, whose sneering at the feast will come off as elitist, whose taunts will come off as slights to the harried mom or dad who picked up a Big Mac and two Happy Meals on the way home from work. Here is an easy chance to play up the “us against them” angle that has formed the heart of his appeal, the whole reason for his presidency. If you point out that it’s inappropriate for an official White House dinner, even one for college kids, to consist of fast food, you’re a snob, you don’t get it, you’re out of touch, you hate the working man. The flip side of this coin is “woke” Gillette. The venerable razor-blade manufacturer has decided that the toxicity of masculinity is too much for it to bear. In a rousing advertisement designed to show just how progressive the act of removing stubble from your chin can be, the brand debuted a new ad campaign with an almost-two-minute video showing just how far we dudes still have to go. Catcalling? Teasing? Bullying? Roughhousing in the backyard? The phrase “Boys will be boys”? To the ash heap of history, all of you. This is a new day, one in which our clean-shaven menfolk will take to the streets and right historical wrongs, tamp down their desire to mansplain, struggle against the barbarian within that demands physical satisfaction when a slight is experienced. Like Trump’s play to his base, Woke Gillette’s play to its base – or, I suppose, what it hopes to claim as its base: the Ethical Consumer Signaling His Virtue, a valuable subset of customer, as Nike discovered with its Colin Kaepernick campaign – is nominally beyond reproach. Oh, you’re in favor of bullying? Do you even know the suicide stats in this country? You don’t support #MeToo? How dare you back sexual harassment by mocking this awareness-raising effort? Of course, both the Fast Food Feast and Woke Gillette are explicitly designed to inspire mockery and, therefore, implicitly designed to encourage the us-vs.-them dichotomy that defines modern American life. One of my favorite moments in FX Networks’ long-running sitcom “It’s Always Sunny in Philadelphia” comes when one of the characters, upon hearing of the gang’s latest scheme, asks, “Who versus? Who are we doing it versus?” The idea that something could be undertaken without having a “mark” to target or an “angle” to pursue baffles the show’s awful protagonists. “Whose face are we shoving this in?” is always the question. Perhaps I have grown cynical in my middle age. Perhaps the politicized life has broken my spirit once and for all. But I can’t help wondering the same thing whenever I see an ostentatious display so obviously designed to aggravate some segment of the population while nakedly appealing to those on the other side of the political spectrum. In the case of Trump and Gillette, the answer to “Who versus?” seems clear.